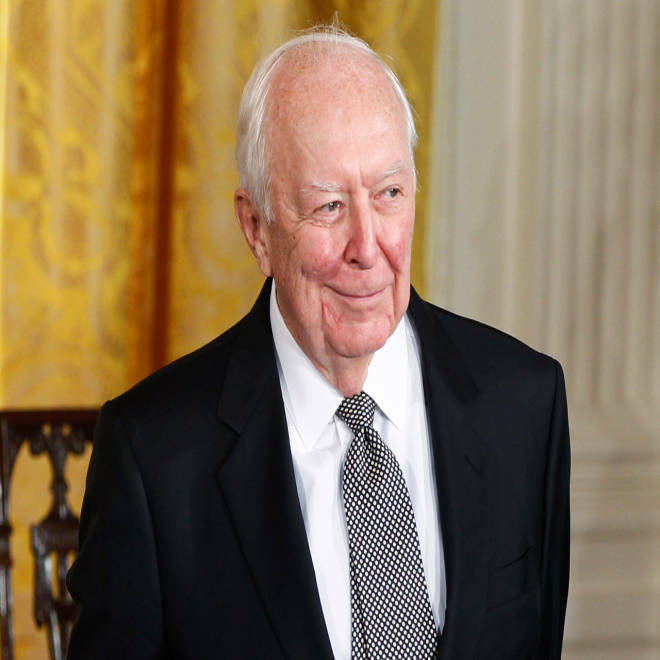 American artist and Medal of Freedom recipient Jasper Johns stands at the White House in Washington in 2011. A long-time trusted assistant to renowned contemporary artist Jasper Johns has been charged with looting and selling nearly two dozen works from his Connecticut studio, pocketing $3.4 million. James Meyer, 51, filched unfinished pieces of art, created notarized documents that stated they had been gifted to him, and took them to a Manhattan gallery, federal prosecutors said Thursday. In an attempt to keep the scheme under wraps, the pieces were sold with the agreement that the buyer would not exhibit, loan or re-sell the works for at least eight years, Manhattan U.S. Attorney Preet Bharara said in a statement. "As alleged, James Meyer is the latest in a long line of thieves who sought to make millions through a fraud on the art world," Bharara said. Johns, 83, who splits his time between Sharon, Conn., and the island of St. Martin, could not be reached for comment. Best known for his iconic flag paintings, Johns' work is prized by collectors and museums. When the Whitney Museum of American Art bought "Three Flags" for $1 million in 1980, it marked the highest price ever paid for a painting by a living artist. The pilfered work included some pieces that John had not even completed, officials said. He had not given permission for any of them to be sold. But to make it seem as though he had, Meyer allegedly created fake inventory numbers for the stolen pieces and forged pages in a loose-leaf binder that served as a register of all of Johns' artwork, even going so far as to photograph the pages and give them to prospective buyers. Between 2006 and 2012, the gallery owner sold 22 pieces for $6.5 million and Meyer got more than half of that, prosecutors said. The gallery was not named. The Manhattan gallery that represents Johns, Matthew Marks, had no comment on the case. Meyer, who had worked for Johns for 25 years, is charged with one count of wire fraud and one count of interstate transportation of stolen property and faces a maximum sentence of 20 years if convicted. After a court appearance in Hartford, Conn., he was released on $250,000 bond and told to stay away from the artist. His attorney, Donna Recant, did not immediately return a call for comment.